In collaboration with the U.S. Department of State’s Bureau of Educational and Cultural Affairs, Meridian International Center administered the Study of U.S. Institutes for Student Leaders for Public Policy and Government Leadership (SUSI) in the summer of 2013. The program was a combination of leadership training, cultural exchange, and rigorous classes designed to give participants a better understanding of the United States, as well as transform them into more effective and successful leaders. SUSI was designed as a four-week program that was implemented in 2013; however, alumni continue to make changes in their communities by using the skills acquired from SUSI programming, as well as mini-grants to initiate these social good projects. Swechhya Sangroula is one alumna who is working on a local level to effect change on a global scale. After completing the SUSI program, she was inspired to create the Not for Sale campaign, an anti-trafficking initiative. As a resident of Nepal—a country where each year, 100,000-15,000 girls are trafficked— Swechhya created the campaign to fight human trafficking in all of its forms and to fight the “world of indignity and exploitation”. Once Swechhya realized that human trafficking was a niche issue, which was only discussed by human rights and law students , she decided to raise as much awareness as possible about the problem. The challenge with reaching the general public was the level of apathy among people. Human trafficking is an issue that affects thousands of people, but to those who cannot see or feel the effects, advocacy campaigns and efforts to make actual change fall on deaf ears. Her first initiative in the Not for Sale campaign was therefore to create a buzz about the issue. She is working to increase the presence of the Not for Sale Facebook page—a page that received 900 likes a week after creation!—and is encouraging those interested in the campaign to write poems, submit pictures, and use any other type of creative outlet to gather attention and feedback. 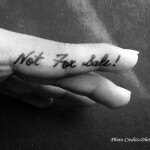 One popular social media initiative that her team displayed was pictures of participants who wrote “Not for Sale” on their hands. Besides social media, the Not for Sale team has been recruiting volunteers to take to the streets to garner attention and interest in the issue. On Valentine’s Day, eight Not for Sale volunteers were stationed at the Civil Mall in Kathmandu to hand out 100 blue hearts with the words “This Valentine, give your loved one a blue heart and fight human trafficking”. On March 8, in conjunction with International Women’s Day, Not for Sale volunteers handed out anti-human trafficking material at a program organized by Amnesty International Nepal that featured Secretary General Mr. Shalil Shetty. Reaching as many people as possible is one of Swechhya’s biggest goals in her Not for Sale campaign. These events, as well as a Color Campaign at Kathmandu School of Law on March 14 that coincided with the Holi Festival in Nepal, had an impact on over 250 individuals. Thanks to her experiences with SUSI, Swechhya was able to integrate learned leadership tactics into her campaign. She decided to take a horizontal approach to management, and learned that allowing her volunteers some leeway led to more creative project approaches. For example, one volunteer was able to book an art museum for an event for only fifteen dollars—a venue that would have ordinarily cost much more. As much as Swechhya has accomplished in the past couple months, she has more plans for the future. To generate more attention, Swechhya is working with local performers to create community street drama events around Kathmandu, as well as an art exhibition at Patan Art Museum centered on the buzzword “Not for Sale”. She also intends on reaching out more to the legal community. Other future plans include a meeting with Armed Police Force Officials about combatting human trafficking as an organized crime, and discussing legal reform with law students at Kathmandu School of Law and Nepal Law Campus. Through these initiatives, the Not for Sale team aims to not only raise awareness, but also effect actual, legal change to combat the issue. POST TAGS: Community Engagement, Nepal, Not For Sale, SUSI, Trafficking, U.S. Department of State.